We begin the julian calendar new year taking a look at boundaries. Do we have any? Do we cross them? Do we have too many? Or are we lost at sea drifting and floating in and out of our worldly existence without any true sense of self and our place in it. Let’s start with the simple stuff first. What does it mean to have boundaries? Or more importantly, healthy boundaries? It means interacting with others in such a way that afterwards we’re left feeling joyful, calm, at peace…or in other words, in a good place. Anything else means we either let them walk all over us or we walked all over them. See? Simple. Right? With so many aspects to the concept of boundaries, we could easily take all of 2015 to attempt to cover them all. For this month let’s take a look at just one of them: the idea of fixing others or others trying to fix us. What does this have to do with boundaries? You’ll see in just a minute…or two. Most times when we share our troubles, what we really want is to have the other person just listen; to hear what’s really going on with us. As soon as the “fix-it” statements start to fly, we can start to feel picked on, less than, stupid, highly inadequate, or that there must be something wrong with us, or something is broken in us. If all you want to do is have someone listen, then start the conversation by letting the other person know that you just want them to listen without them offering up any solutions at the moment. Often times just talking about stuff with others gets it out of our heads, giving us a clearer picture and most times providing us with our own, most obvious, solution. If you truly want to have someone help you, then start the conversation by letting the other person know “hey, I’ve got this issue and I could really use your help with ideas on how to deal with it.” (or words to that effect). A variation on #2 could be to share your issue and if the other person has yet to offer any suggestions, then ask them “what would you do in this situation?” thereby letting them know that you would like to hear their ideas. In both cases we’re declaring our boundaries (see?). We’re letting other people know up front what we need/want from them. At the same time they now know exactly what we want from them so that they can be there for us in that capacity…no more, no less. How about if we’re the ones crossing the boundaries and just chiming in with “fix-it” ideas as they share with us their woes. Whole different ball game, right? Sorry to burst that bubble. Same ball game, different side. If we understand why we want to offer “fix-its”, we can better control our compulsion to do so. Most (maybe all) of the time, we offer fix-its because we really care about this person, we want them to be happy, we can see a better way (in our opinion) AND we want to help, we want to come to the rescue! SPOILER ALERT! Not everyone is looking to be rescued. Ah! What a concept. Most people who share their woes just want to be heard, to have someone truly listen to them and understand their situation…without judgement or criticism. Next time someone shares their troubles with us, instead of thinking of all the things that this person could/should do, let’s just listen to them, maybe asking questions here and there for clarification purposes only. This lets the other person know that we respect their boundaries and are giving this person the option to allow us in or have us stand back. It also gives them another option to ask that we hold off until another time when they are more ready to listen to our ideas. As an introductory to boundaries, this mandala suggests that we examine and honor our own boundaries and the boundaries of others. We tend to make assumptions and charge on ahead with good intentions without realizing that the other person may need/want something completely different from us. Or we keep our needs/wants to ourselves hoping others will “figure out” what we want, only to feel disappointed when they assume incorrectly. We can easily remedy the boundary issue by letting others know what we need/want from them and ask that they respect our wishes. And in turn, by asking others what they want/need from us and respecting their wishes. In the end we must be willing to let others travel their own journey, as we would want others to allow us to do the same. It’s that simple. Ponder this as we color this month’s mandala. 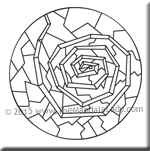 Be sure to download Section 1 of the 2015 Mandala of the Year.